Up next in this L.A. track series turned Marmonte League series, we have the track at Thousand Oaks High School. 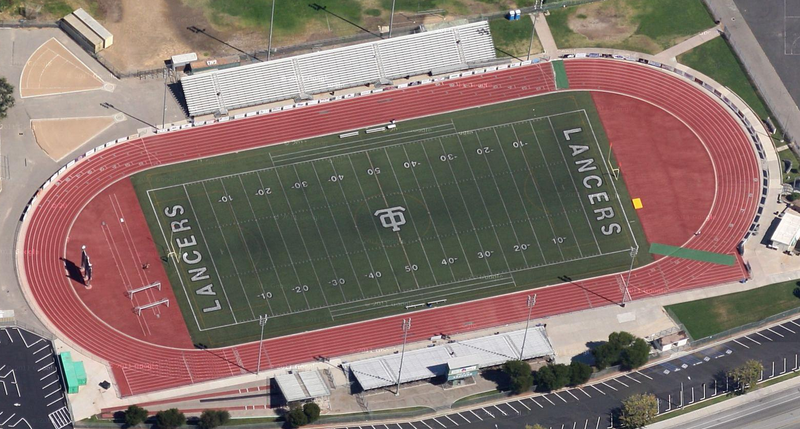 This track is the home of the Lancers teams, and like most of the other tracks in the league, they also have nine lanes. The high jump and pole vault seem to be the only field events that are held on the inside of the track. There are two shot put sectors outside on the northwest corner. Outside the southwest corner you can see the two runways for the horizontal jumps. You’ll notice a couple of interesting things about the runways. First of all, they are at different angles, and are not parallel to each other. Because of the parking lot angle, this is a great use of space here, and I’m guessing it works very well. It also results is having more space around each of the sandpits. I know with two pits right next to each other, and can get pretty cluttered, especially during meets when both are being used. The other very unique feature is that you cannot see the pits, as they are covered by what looks to be an addition set of bleachers. If you switch to the overhead view on Google maps, this “cover” isn’t there. It also looks like the bleachers are raised up higher than the main bleachers to the east, so I guess there must be enough room for clearance underneath to allow for jumping. I could not find any photos of the pits to find out what it exactly looks like, but I’ve never seen anything like it before.